Nothing is more annoying than a saggy tummy. But why spend lots of money on expensive spa treatments. 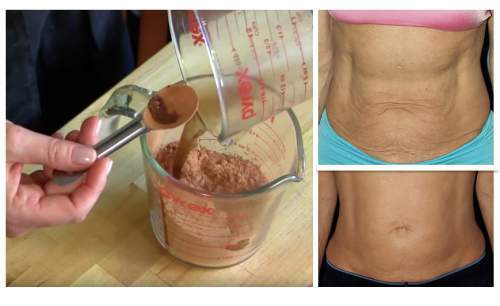 With a few inexpensive ingredients, most of which you probably already have in your cabinet, you can create a simple homemade masque that will tighten and firm saggy stomach skin. All of the ingredients found in this masque (witch hazel extract, coffee, tea, oil and clay) have their own skin restorative properties. For instance, witch hazel has long been used as a home remedy for various ailments. In this case, it is used as an astringent to tighten the skin. Coffee and tea, morning-time drink staples, are both useful for their ingredient tannic acid which has a protective effect on the skin. This masque is a definite must-try. No one thinks twice about putting a masque or moisturizer on their face to reduce wrinkles and tighten and firm skin. It’s just as simple to add this step to your morning or evening beauty routine. You’ll be shopping for bikinis in no time!